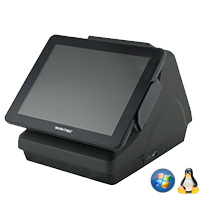 AnyPos 200 is an all-in-one compact POS with capacitive touch screen, built-in thermal printer available for both of 80mm and 58mm paper roll and integrated customer display. Based on latest Inte’s Bay Trail or ARM CPU, Comes with 9.7″ or 12.1″ screen size. Suitable for customers that want small footprint solutions without compromising performance. Qingdao Wintec System Co., Ltd.